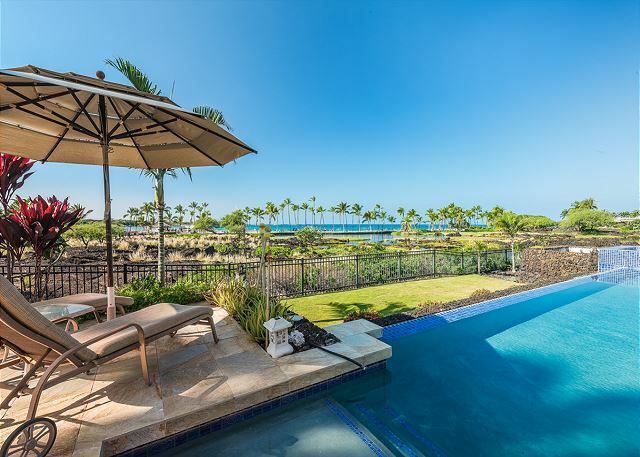 Enjoy ample space for any occasion at this luxury 6 bedroom private home at Kolea at Waikoloa Beach Resort. 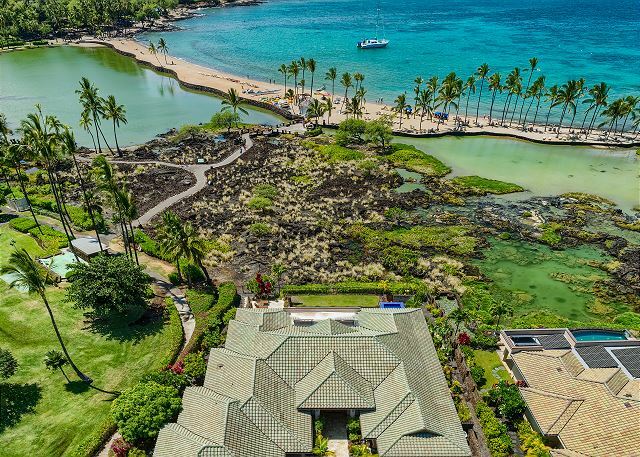 Situated in an ideal location this home offers easy access to the beach, Kolea Beach Club, as well as amenities at the Waikoloa Beach Marriott. 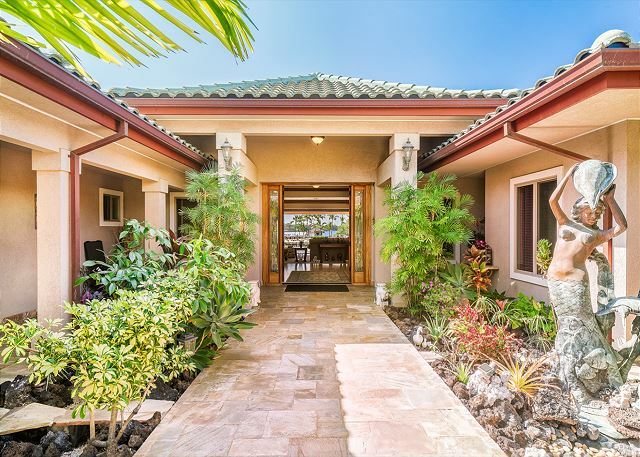 As you enter through the private gate you will be struck by the spaciousness of the property as well as size of the home. 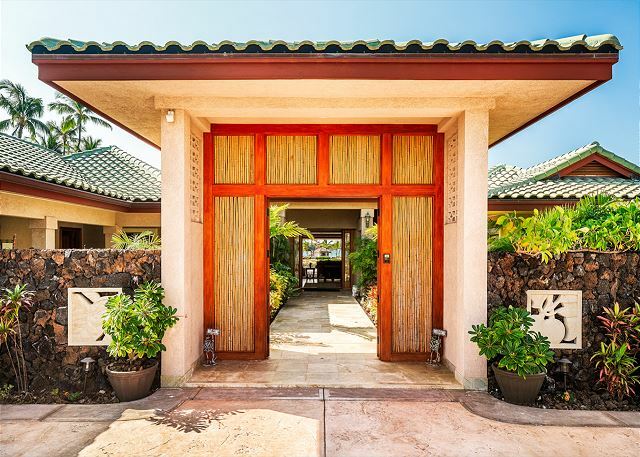 After walking through the large doors into the home you will be struck by the amazing ocean and beach views. 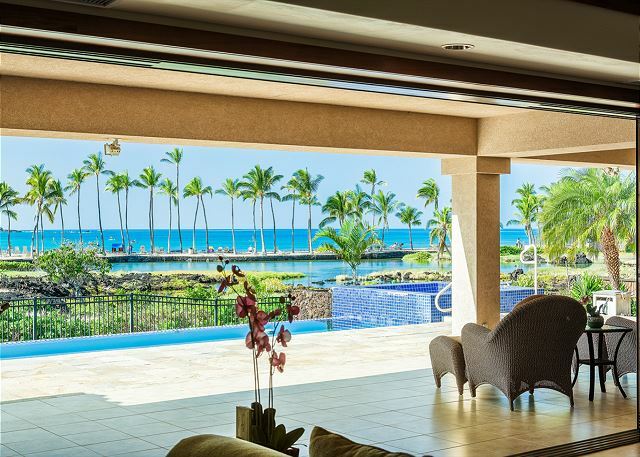 The living room overlooks the lanai and pool onto the beach and ocean. 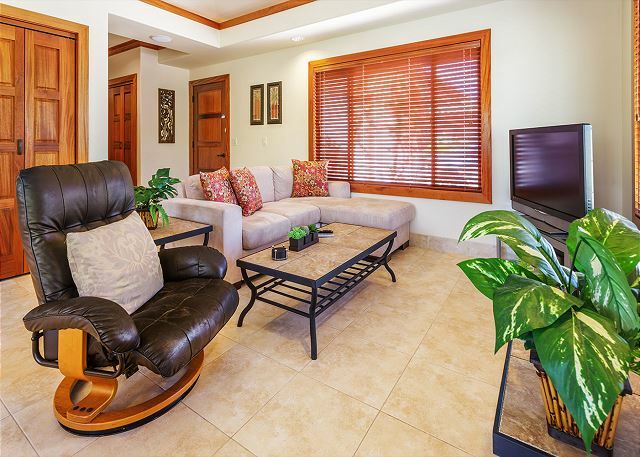 Here you will find a sofa and two chairs that look out to the view and to the entertainment center. 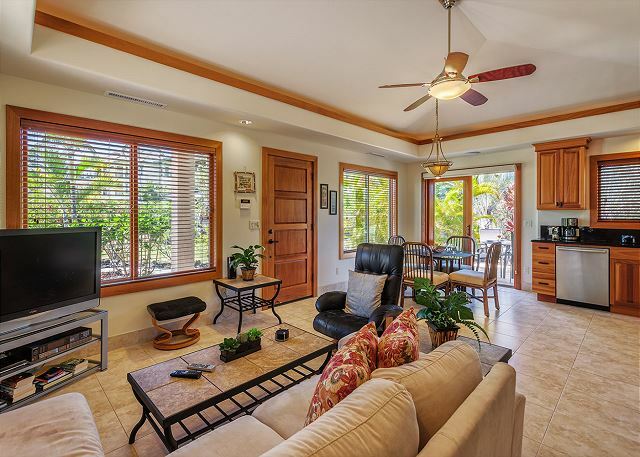 The entertainment center has a large wall mounted LCD television with a DVD player and surround sound. 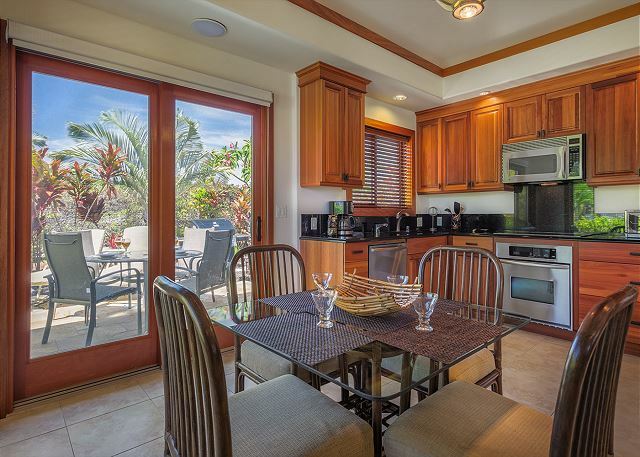 Adjacent to to the living area is the gourmet kitchen and dining area. 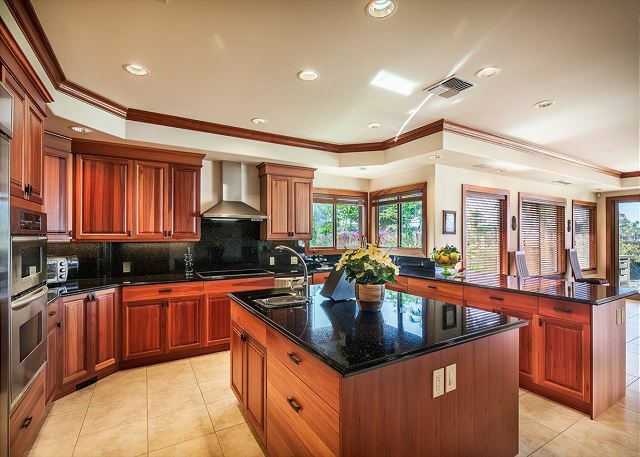 The kitchen is well stocked and features granite counters and stainless steel appliances with beautiful wood cabinetry. The interior dining area seats 8. 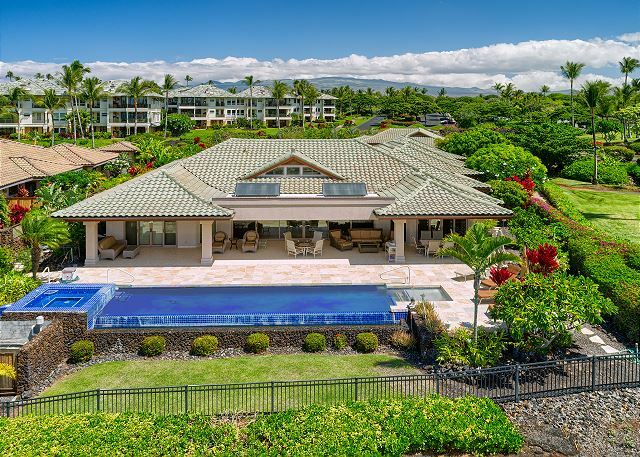 Both the living and dining areas open up to the expansive lanai and view. 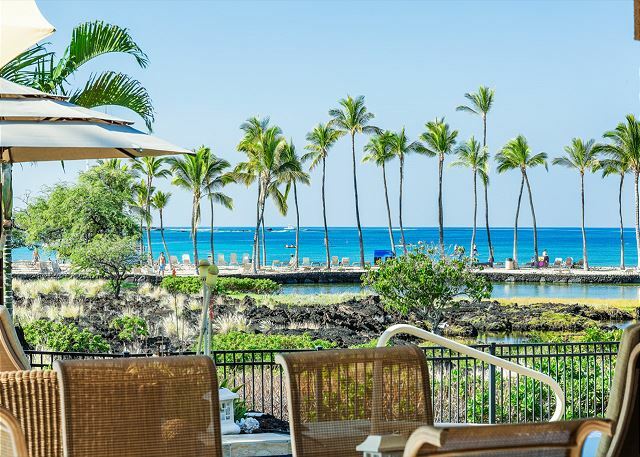 The lanai is filled with different set ups to enjoy whether it be to read a book or to enjoy dining outside while listening to the sounds of a Hawaiian luau next door. 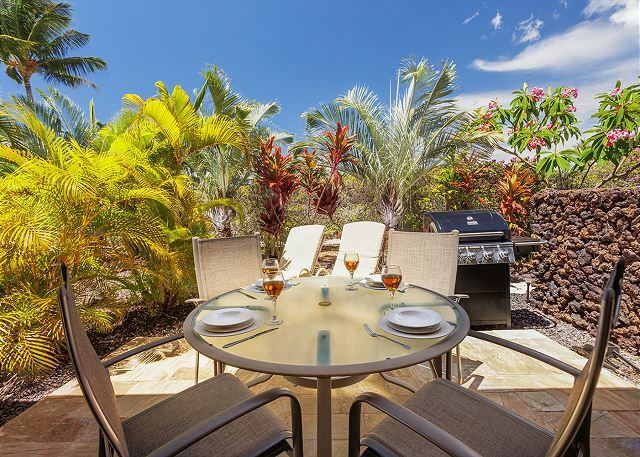 There is also a stainless steel BBQ grill on the lanai for your use. 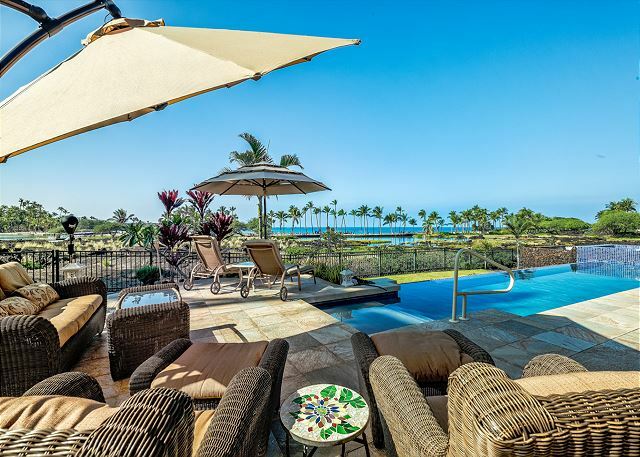 The pool overlooks the amazing view and is great for just relaxing or swimming laps. 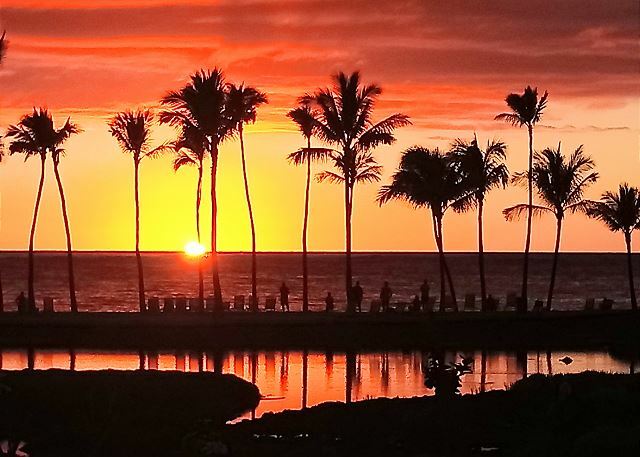 In the evening you can enjoy a beautiful Hawaiian sunset while relaxing in the hot tub. 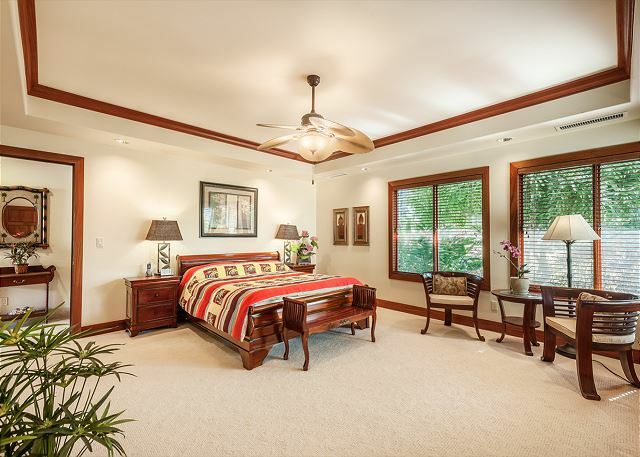 Just off the living room is the master bedroom. 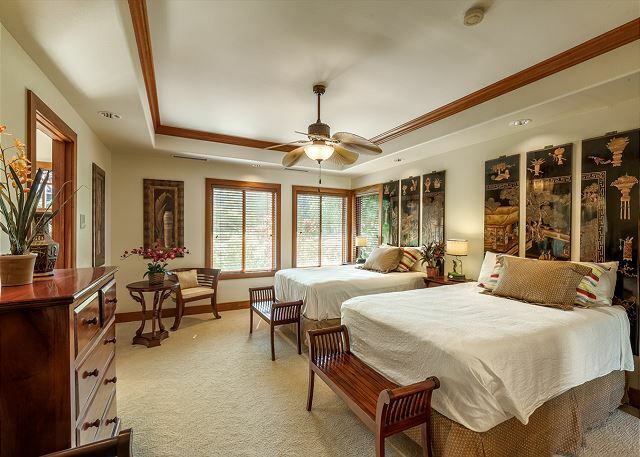 This room has a king size bed with bedside tables and plenty of windows that showcase the spectacular view. Across from the bed is a nice sitting area as well as a wall mounted LCD television with a DVD player and a chest of drawers. 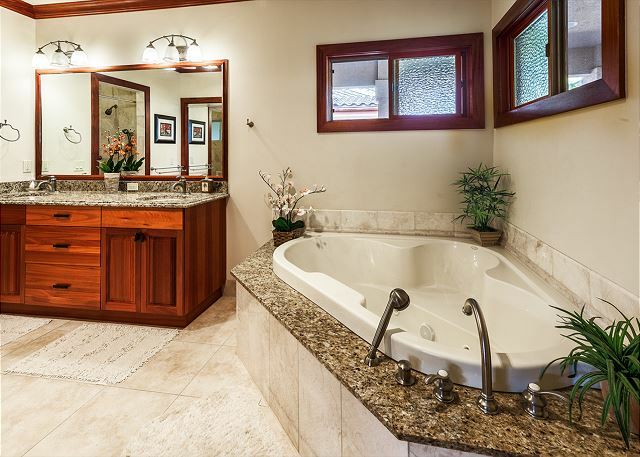 The attached bathroom has dual vanities, a deep soaking tub, and a large walk in shower with multi zone spray heads. 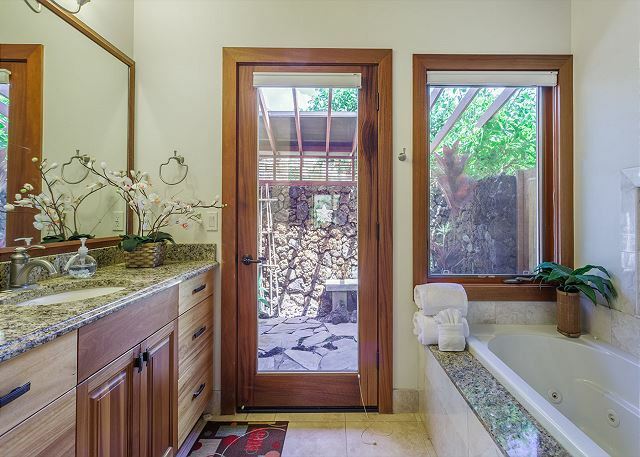 If you want to get the full enjoyment of Hawaii take a shower in the outdoor shower. 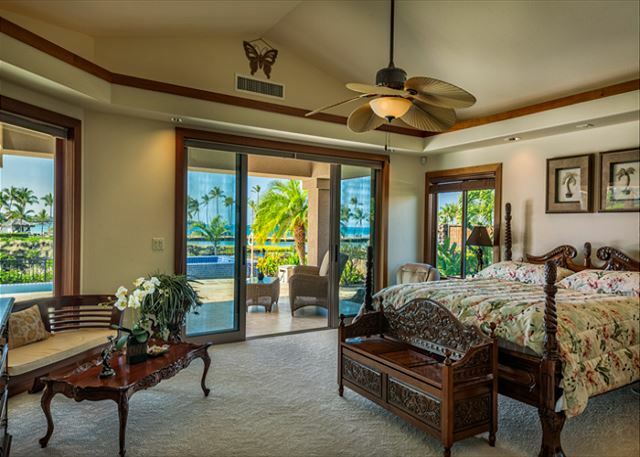 The second master bedroom has a king size bed with bedside tables with ample windows that offer views of the tropical landscaping. 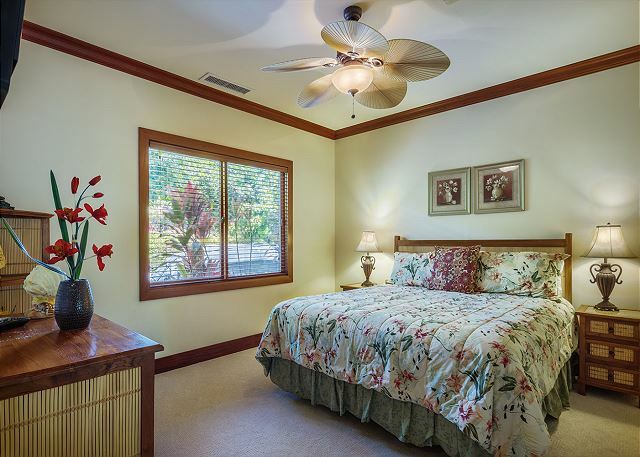 The first guest bedroom has a king size bed with beside tables and also has plenty of windows that open up to the tropical landscaping. Across from the bed is a LCD television and there is also a nice sitting area. The attached bathroom has a deep soaking tub, dual vanities and outdoor shower. The second guest bedroom has two double beds with a beside table. The woodwork in the room gives it a very elegant feel. 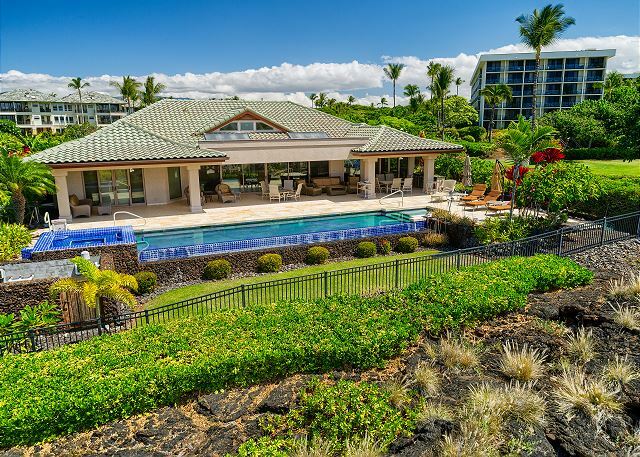 The attached bathroom has a large walk in shower with multi zone spray heads, dual vanities, a jacuzzi tub, and an outdoor shower. Other amenities of the house include multi zone air conditioning, wifi, and a laundry room with a full size washer and dryer. 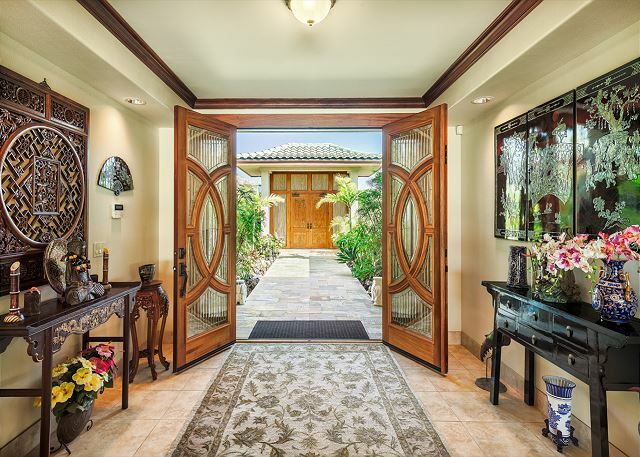 Through the front doors of the guest house is the great room. 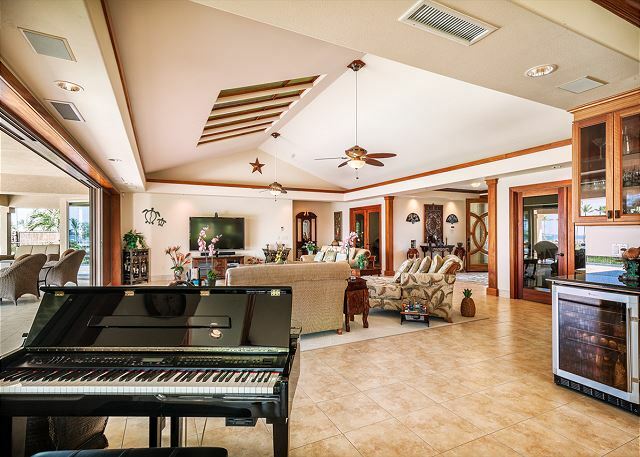 Here you will find the living area with with a couch and Ekornes reclining chair facing the entertainment center, which features a LCD television and a DVD player. 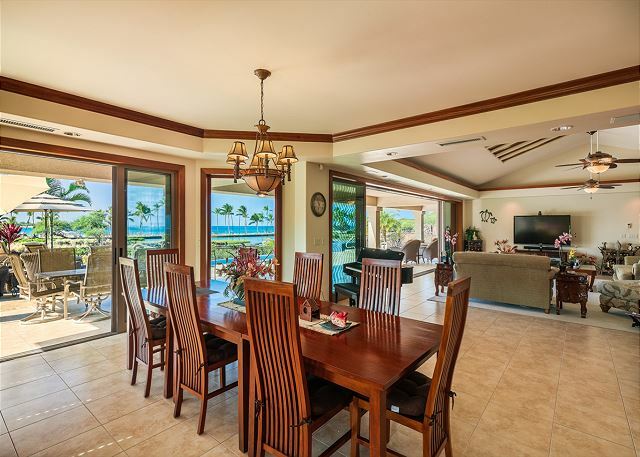 On the other side of the great room is the kitchen and dining area. 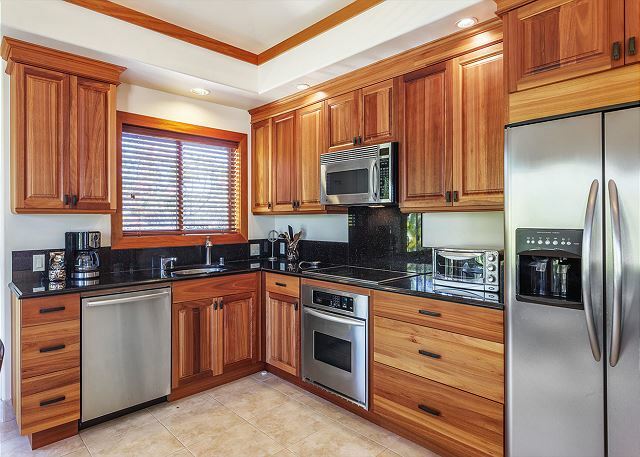 The kitchen has granite counters, stainless steel appliances, and is well stocked for all of your cooking needs. The dining area seats six. 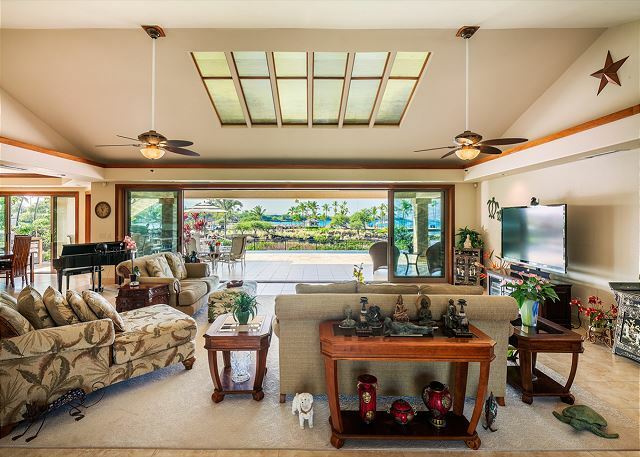 There are windows throughout the great room that open up to lush landscaping. 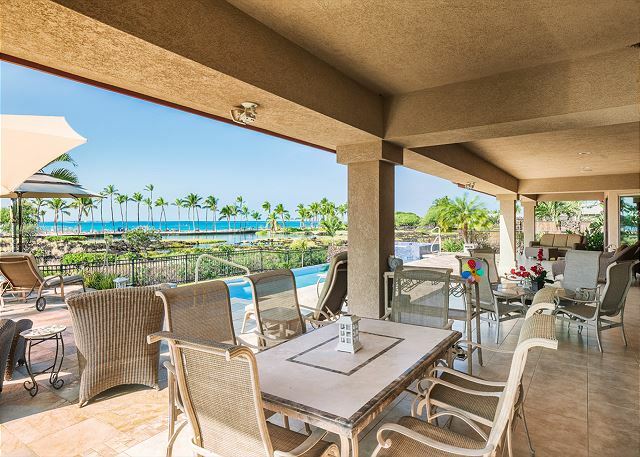 Just off the dining area is the lanai with a table and chairs, two lounge chairs, and a grill for your use. 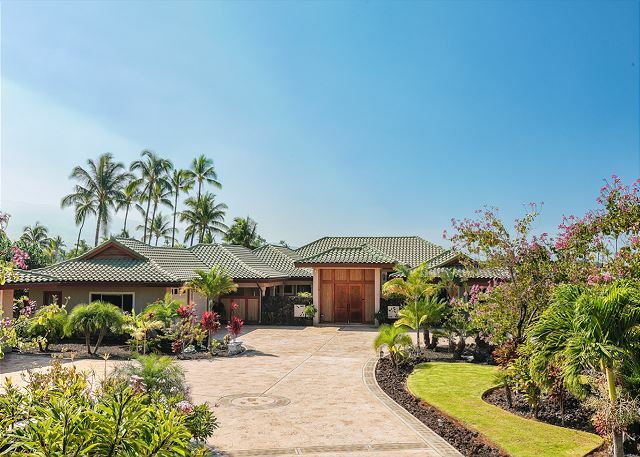 On the other side of the home are the two master bedrooms. 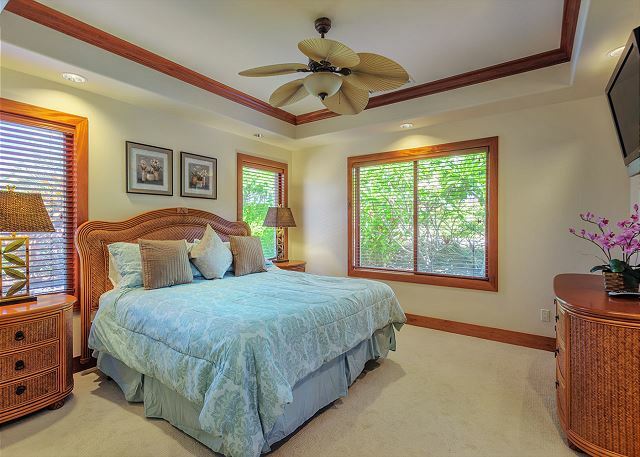 The first master bedroom has a king size bed with bedside tables facing a wall mounted LCD television. 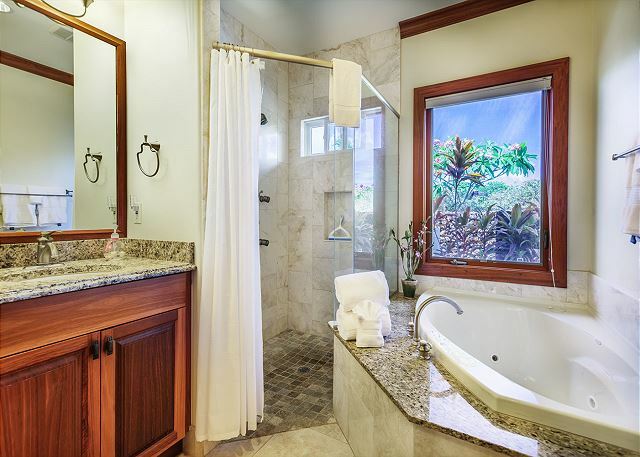 The attached bathroom has granite vanities, a walk in shower, and a jacuzzi tub. The attached bathroom has granite vanities, a walk in shower, and a jacuzzi tub. 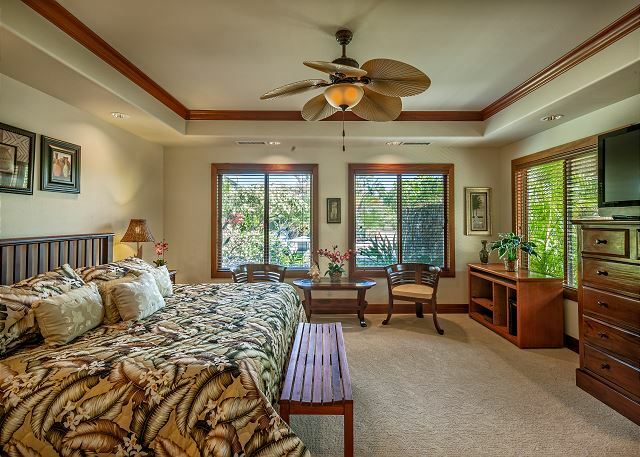 The second master bedroom has a king size bed with bedside tables facing a wall mounted LCD television. 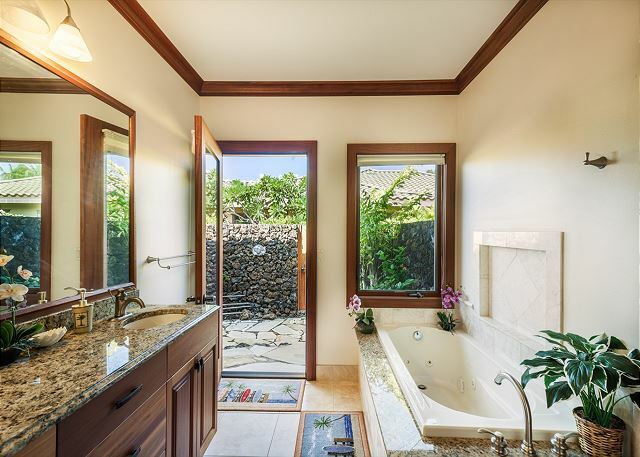 The attached bathroom has granite vanities, a jacuzzi tub, and an outdoor shower.